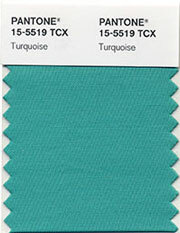 Pantone has named turquoise as its color of 2010. “In many cultures, Turquoise occupies a very special position in the world of color,” explains Leatrice Eiseman, executive director of the Pantone Color Institute. “It is believed to be a protective talisman, a color of deep compassion and healing, and a color of faith and truth, inspired by water and sky”, Eiseman further states. Look for lots of different ways brides will be using this color in their wedding color scheme. In the next few weeks I’ll be posting some different color combinations that I think will be front and center this spring and summer.